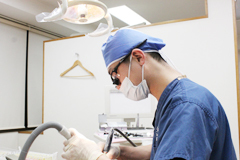 This page introduces you to the message from the director and information on the staff of Nakamaru Dental Clinic located in Ishikawa-cho, Naka-ku, Yokohama. We are very sorry to inform you that as of April 1st, 2015, we will no longer be accepting Japanese National/Social Insurance plans. The Japanese insurance system was established about 50 years ago and, since that time, has not taken into consideration today’s science and technology. Its regulations seem to be the reason why Japanese dentistry has never acquired a good reputation in foreign countries. A simple example: many foreigners wonder why so many Japanese have silver coated or crooked teeth. 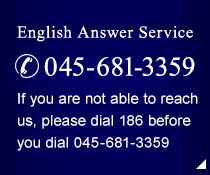 We want to solve your dental problems, as well as earn high respect for Japanese dental treatment from overseas. 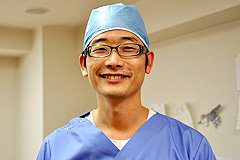 When you return to your country, we want your home doctor to be impressed with the great treatment performed in Japan. However, even if we work very hard, as long as operations are performed under the Japanese National/Social Insurance scheme, the ways and materials to be used are so restricted that we cannot offer satisfactory treatment. I sincerely hope your healthy status will last long by having a global standard of dental treatment. Our motto is "contribution, consideration and confidence." With the development of technology, dentistry has advanced at an incredible pace especially for the last decade. Treatments that were common have become outdated in such short years. At our clinic, all staff members are trying to learn the latest technology while actively attending workshops and academic meetings to provide our patients with safe and reliable treatment. Our goal is not only to provide our patients with symptomatic treatment but also to fix their fundamental problems. Oral health is significantly related to overall health. In order to offer our patients real benefits, we strive to satisfy them by fixing all their problems as well as providing adequate counseling. 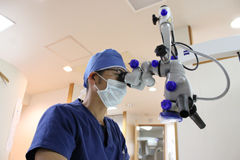 Our dentists use magnification glasses or a microscope even for simple treatment that can be done with the naked eye. "Visually examining as thoroughly as possible" is absolutely essential for high-quality treatment. We secure as long time as we need for each patient to provide high quality treatment. As the number of patients we can see a day is limited, please let us know as soon as possible if you want to make an appointment or cancel your appointment. However if you have an emergency, such as sudden toothache, please contact us anytime. Completed Fujimoto workshop's endodontics one year course. Completed AADC (Osaka)'s one year course. Completed Osaka SJCD's regular course (one year course). 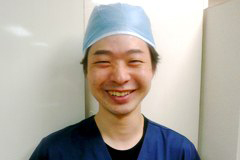 Completed Clinical Implant Society of Japan's 100 hour course. Certified as a clinical training advising dentist by Ministry of Health, Labour and Welfare. Returned to Japan/Worked for Otsuka Dental Clinic. Studied under a UCLA clinical professor, Dr. Thomas Han (U.S. periodontics and implant specialist). Became a resident of a private office. Received US Nobel Biocare implant certification. UCLA (University of California, Los Angels). Worked for Otsuka Dental Clinic (in Kawasaki City). Graduated from Kanagawa Dental University. Worked for Miura Dental Clinic (in Miura City). Completed the Graduate School of Orthodontics Class, School of Dentistry, Showa University. Entered the Graduate School of Orthodontics Class, School of Dentistry, Showa University. Graduated from School of Dentistry, Showa University.